As I look over the pretty white dashboard with the silver rings in my Fiat 500e, I smile when I see another 500e on the road. Most of them have their stickers so they can ride in the car pool lane and skip tolls on the bridges. As a borrowed test car, mine doesn’t. I enjoy seeing a BMW i3 whiz by. Nissan Leafs are common, distinguished from each other only by color. It’s nice to see the new 2016 Chevrolet Volt is taking off. I see them frequently, with their all-new look. Their unique taillamps flaunt a fresh signature on the way home at night. But, we EV drivers are still a tiny minority on the highways and byways of America. For every one of us there are 100 Ford F150s or Toyota Camrys or Chevrolet Tahoes. Cheap gasoline has encouraged a boom in larger cars, so even intelligent choices like the Honda Fit or Hyundai Elantra languish. Sergio Marchionne, head of Fiat Chrysler Automobiles, said he’s ramping up production of big Jeeps and reducing production of smaller, more efficient Dodge Darts and Chrysler 200s. Why? Because big Jeeps are the cars that people are buying, and he has to run his company at a profit. It’s a good–even necessary–business decision, but it’s not helping the environment. Marchionne has already stated that FCA loses thousands of dollars on every little Fiat 500e it sells (although the company gets credits towards its Federal clean air obligations). 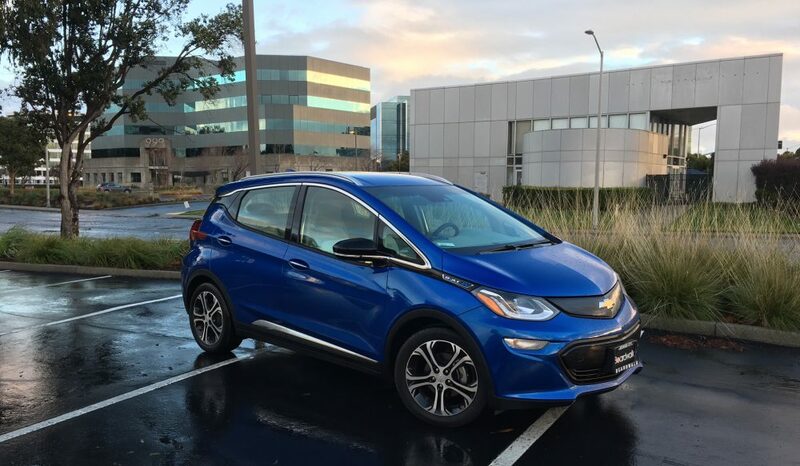 The people are speaking, and most of them are not EV enthusiasts. They want what they want and like. You can’t blame them. Like the climate crisis in general, if you can’t see it, it’s hard to muster up the energy to do anything about it. To my left, a giant, black Cadillac Escalade momentarily blocks out the sun. It’s going to be a long haul (but worth it). When you’ve got an electric car and lots of things to do, you need to plan accordingly. Yesterday, I would have taken Fidelio, the little blue Fiat 500e, on my errands around town, but I had to top off his battery so he’d be ready for a 30-mile trip today. Also yesterday, while my wife, son and I drove to a family dinner 80 miles from home, he remained here in the driveway, tethered to the charger. I think he looks a little sad, but it could just be the camera angle and the rainy weather. Today, he gets a nice freeway cruise into Oakland. I’m expecting little traffic, so there won’t be much chance to regenerate power. With a full battery, this should be no problem. I’m sure this range business will be part of my life as long as my three-month test lasts, and it takes thinking and planning–something you don’t do with a normal gas-powered car. But I’m already finding that it helps you reduce driving in general, and cleverly combine trips to maximize economy. As long as you have a petroleum-drinking second car around, it’s all possible. Well, it’s been a great week of commuting and charging at work, but now that I’m home for the weekend, it’s time to plug in in my garage. I wish my garage wasn’t so full of accumulated junk, but it is, so I have to use the method I’ve used with my other electric test cars–I plug in the charging unit inside the garage, attach the charging plug into the socket inside the “gas” door on the right rear corner of the car (backed in, of course), and then lower the garage door down to about an inch away from the concrete. This is easy in clear weather, but is less pleasant when it’s raining. I did check, though, and the water doesn’t seem to want to drain into the garage. With Fidelio, my blue 500e, visiting into the springtime, I really need to clean out the garage so he can sit inside. Since Fidelio came to me new, with just 79 miles on the odometer, I am the first journalist to drive him, so I got to take the charger out of its original plastic bag from the factory. It came with a slim User Guide, but I’m an old hand at home charging, so I left it in the bag for future journalists. Fiat provides a sturdy, and long-enough, cord. You’re cautioned not to use any extension cords when charging. Most are probably not rugged enough to handle the job. When it’s plugged in, you can see it working by the movement of the green lights in the bar above the Fiat logo. There’s also a light inside the car, on the top of the dashboard, that shows an approximate level of charge in the car–kind of like the five dots on a Fitbit Flex. So, I set it up and that was that. Sadly, home current, at 120 volts (known as Level 1 charging) is very slow. My level 2 ChargePoint chargers at work (240 volts) are much more efficient. Here’s a record of my four visits to the chargers this week from the ChargePoint phone app. Fidelio had a partially full battery when I plugged in, but was topped off by lunchtime (on Wednesday through Friday). The Fiat 500, in any form, is a very small car. Granted, the 500X crossover and 500L are a little larger, but still, the regular 500 is dinky. But don’t assume that being diminutive means being Spartan or uncomfortable. Nope, my little 500e, Fidelio, is a very pleasant place to be. Granted, the rear seats aren’t spacious, but I did fit my 5-11 son back there last night (for a short trip). It’s the other things that lift the 500e up. One thing is the leatherette seats, which are soft and stand up tall. The two-tone black/white look is chic, blended with the overall black/white theme of the entire car (a $395 option, and worth it). Cheap cars are all black or gray. White is a fancy color. The plastic panels on the dash evoke the painted metal of the 500’s 1950’s ancestor, as do the chrome rings around the gauges and round control buttons. Nice. From a modern point of view, there’s SiriusXM Satellite radio, and it’s easy to manage from the steering wheel controls. They’re on the BACK of the wheel, as in all Fiat Chrysler Automobiles products. I love that feature–you never have to look away from the road. Also, the white leather (with red trim) on the steering wheel itself is upscale. Oh–the sound from the audio system is surprisingly good, too. A real luxury is how you hear that audio. With no vibration or noise from an engine, the 500e is blissfully quiet. On the freeway, you may get a little noise from rougher road surfaces, but in town, it’s almost eerily silent, and the music comes in sharp and clear. The 500e has climate control–set it and forget it style. Without a radiator or a hot engine to generate the heat, I’m not sure where it comes from, but it’s a hearty blast when you start out in a 42-degree morning. Heated seats (one level only, though) are common these days, but are often lacking in a “cheap” car. You get ’em here. Having a display on the instrument panel for each individual tire’s pressure is nice. The Audi A3 I drove recently didn’t even have that. The 500e may be narrow, but it’s tall, so you don’t feel claustrophobic. The colorful. friendly instrument panel and small but effective center screen convey lots of useful information, and keep the black-and-white environment cheery. With an electric motor, your car feels more like it’s rolling down the road rather than being dragged along. Stepping on the accelerator (don’t call it “the gas”) generates an immediate push forward. With 111 horsepower and 147 lb.-ft. of torque, the 500e is never poky, even going up the steep hills in my neighborhood. Here’s to many more great (short) trips in Fidelio, the little blue EV. So, here I suddenly have an electric car, and I’m in the mood to top off its battery. Fidelio sits in the lot, waiting his turn. With a total range of about 82 miles, he’s reading 60, which is probably OK, but I want to minimize range anxiety. I wait for the morning shift to move, but by 1:30 p.m., still nothing. So, I found out that there’s an emailing list at work for #EVDrivers. I sent out a plea, with a friendly announcement of my new, blue ride, and behold! Two EV owners almost immediately responded, and I saw two free spots from my third-floor window. Down I flew, and drove Fidelio to the ChargePoint array. He tucked in right next to Tesla. After an hour and 49 minutes, I got a ChargePoint notification text. So, I went down and unplugged. I had spent $1.12, and had 84 miles on my instrument panel and a full green bar on the left. I was set. I’ve found out already about at least 10 people at work who have electric cars, and am looking forward to getting to know the ones I don’t know already. Maybe we can lobby for a few more chargers. We can talk about new developments, and share any ideas or thoughts that could help. The Fiat 500 is a very small car, but tonight, Fidelio carried my upright bass to orchestra rehearsal. The bass had to go in at a bit of an angle for the hatch to close, so the front passenger would be a little squeezed. But we made it. A successful first day for the little blue car. And what a nice welcome, with a rainy day diminishing briefly, displaying a beautiful rainbow. I drove him around the building to see if any charging stations were open. Nope! I have 60 miles of charge, so I’m OK, but I’m hoping to top him off this afternoon. With only 120 volts at home, it would take longer. So, I’m already “worrying” about charging. But it becomes routine, and with my normal early arrival time, I’ll surely get on one of the chargers without a hitch tomorrow morning.